Life is all about intimacy with God! We were created for that. Everything we do should be done with that in mind. If it is not, we will find ourselves burned out, broken, lame, and empty because it is not good for man to be alone. We were created for relationship, specifically with our heavenly Father. Nothing in this world or in the next one is as important as our relationship with God. 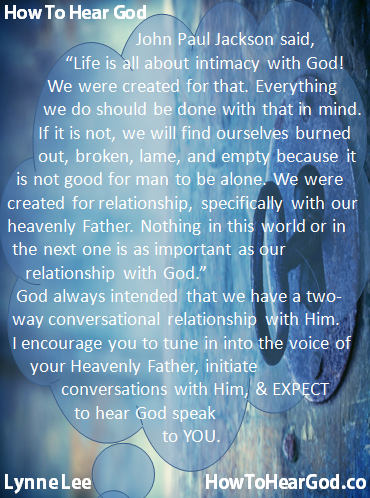 God always intended that we have a two-way conversational relationship with Him. I encourage you to tune in into the voice of your Heavenly Father, initiate conversations with Him, and EXPECT to hear God speak to YOU.